Large cap funds invest in stocks of the companies of large market capitalization. Large cap funds are known for stable returns and ability to minimise the downside risk during volatile market conditions. 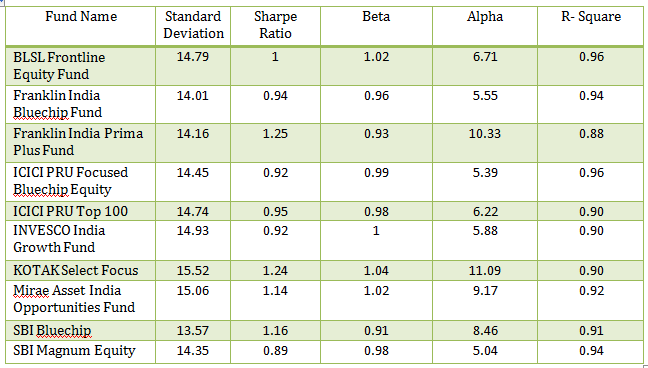 Here are the Best large cap funds to invest in no specific order. The funds are chosen on the basis of return from past and performance*. Launched in August 2002, the fund provides investors the opportunity to “generate long term growth of capital, through a portfolio with a target allocation of 100% equity by aiming at being as diversified across various industries and or sectors as its chosen benchmark index“. Net asset size of the fund is Rs. 15520 crore**. It invests 95% of its asset in equity and rest in combination of debt, unlisted entities and cash. Its benchmark index is S&P BSE 200 index.It has invested 30% of its asset in Banking & Financial Sector, 9% each in Auto, IT and Oil & Gas, 8% in Pharma and rest in different sectors of the economy. The fund has been launched in Dec. 93 has AUM of Rs. 8173 Crore. It is considered as a first mover in its category . It has a blend of being a growth fund and falls into average risk category. Objective of the fund “is aggressive growth and aims to provide medium to long term capital appreciation through investment in shares of quality companies and by focusing on well established large sized companies”. The fund has outperformed its benchmark by 7 percentage points in the last three years. The fund allocates 90% of its asset in large cap and 5-10% is maintained in mid cap. The fund has constantly outperformed its benchmark ( Nifty 500) in a long term investment. It’s investment objective is “growth of capital and regular dividend from a portfolio of equity, debt and money market instruments and focusing on wealth creating companies across all sectors and market cap ranges“. This fund has a CAGR of 19.3% over a 20 year period. The fund invest 65-75% of its asset in large cap, 20-30% in mid-cap sectors. It invest in companies with competitive advantage.The fund focuses on companies with strong business models, competitive advantage that help in maximizing returns in long term. It is one of the best performing fund of 2016 in large cap category. This fund “investment strategy will be to invest in 20 large cap companies from the top 200 stocks listed on the NSE on the basis of market capitalization. In case, the total assets in this fund crosses Rs.1000 crore then more than top 20 large companies would be added to the portfolio”. Relatively a new fund has given good returns to investors since inception. The fund opts for bottom up stock selection to identify companies with good growth potential. The Objective of the fund is to “generate long term capital appreciation by investing predominantly in equities, that is 95% in equities while the rest would be invested in debt and money market instruments”. The fund has outperformed the benchmark in long term. Its AUM is Rs. 1845.6 crore and 88% of its asset is in Large cap and rest is divided to others. READ SIP or Lumpsum Investments. Which is better? The Fund “aims to generate long-term capital growth by investing predominantly in equity and equity related securities following a bottom up approach in selecting stocks depending on their market-cap and sector“. Total AUM is Rs 171 crore and the fund has outperformed both its benchmark and category. Maximum part of the asset are invested in Financial (30%), Automobile (14%) and Technology (13%). The fund is a muti-cap in category. It has outperformed its benchmark index since its launch. The fund invests in “diversified portfolio of equity and equity related instruments, generally focused on a few selected sectors”. 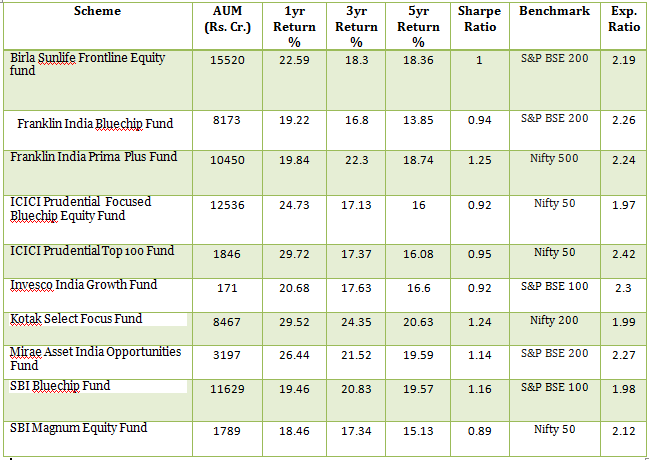 Though it is multi cap, the fund has exposure in large cap with more than 75% for the last 2 years. The fund mainly invests in Top 100 companies with market capitalization; it has the flexibility to invest up to 20% in midcap stocks. Earlier the fund was known as Magnum Multiplier Plus 90. It invests in top 100 companies in terms of market cap. It looks for quality stocks based on fundamentals, market expectations and valuations. The investment objective & strategy is “capital appreciation through investments in diversified portfolio of equities of high growth companies”. It invests is cyclical stocks. The average ten year return is 12.29% against the 8.95 % of Nifty. More than 60% of the fund is invested in Financial, IT and Energy. ** – All the numbers are as of writing of this post i.e 29th March 2017. I have gone through this schemes but confused about risk factor while investing in this schemes.